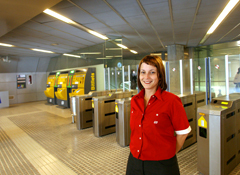 FGC and Metro ticket machines and ticket offices. 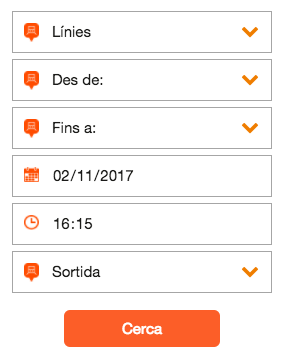 Servicaixa, newsagent kiosks. 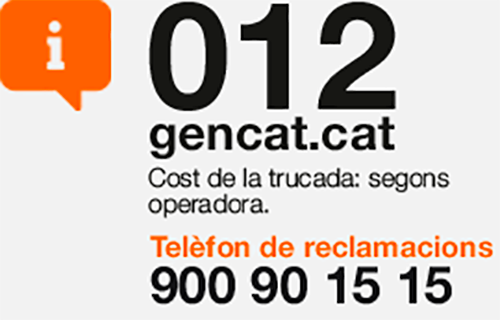 FGC: Plaça Espanya and Plaça Catalunya Customer Service Centres. 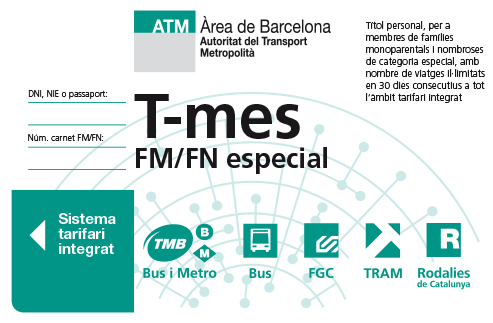 TMB: Universitat, Diagonal and Sagrera Customer Service Centres. 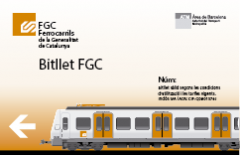 Renfe Rodalies Suburban network: At all station ticket offices. 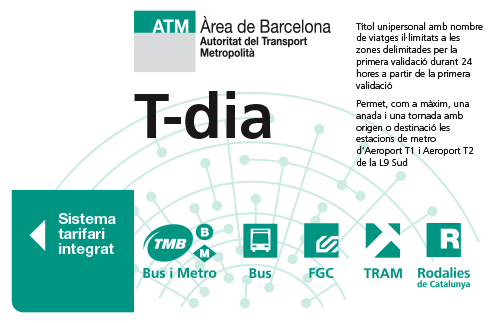 TUS: Sabadell information stand. 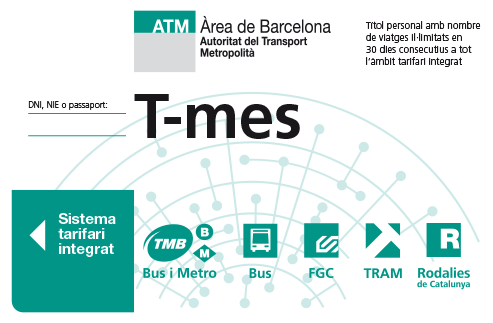 – TMESA: Terrassa information point. – Sagalés: Granollers bus terminus. 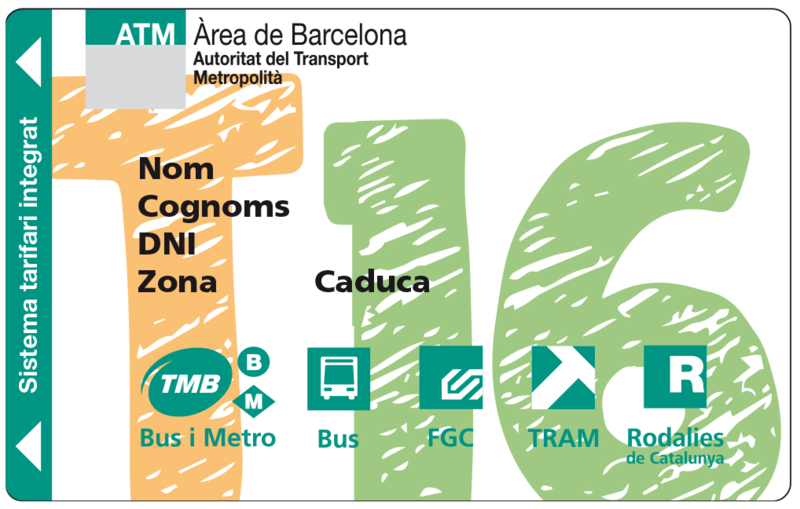 – Hispano Igualadina: Igualada bus terminus. To find out how many areas must be the ticket you need to buy, as well as the price, consult your station of origin and destination in this search engine. 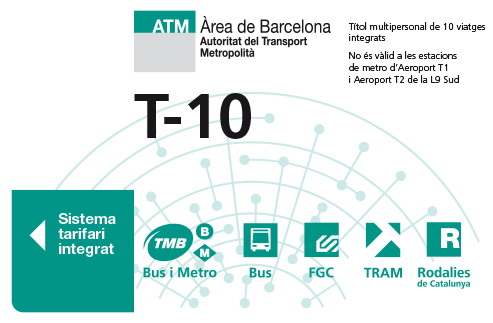 Multi-user timetable-restricted ticket, for 10 integrated journeys on all modes of transport depending on the zones travelled through (maximum payment 6 zones).This ticket is not valid for journeys to airport metro stations. 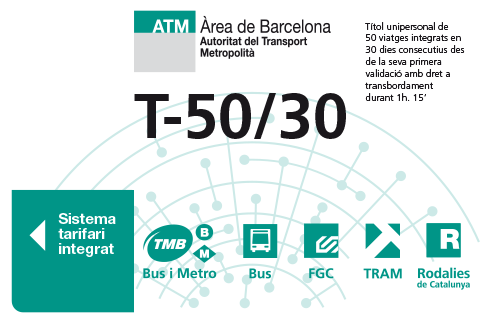 Personal timetable-restricted ticket, for 50 integrated journeys on 30 consecutive days from the first validation on all modes of transport depending on the zones travelled through (maximum payment 6 zones). 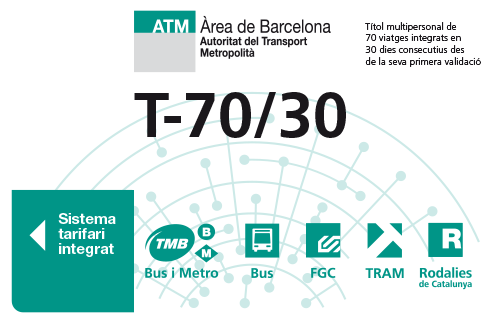 Multi-user timetable-restricted ticket, for 70 integrated journeys on 30 consecutive days from the first validation, on all modes of transport depending on the zones travelled through (maximum payment 6 zones). 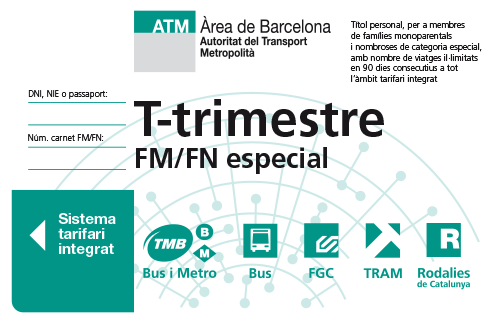 Personal and non-transferable ticket, with an unlimited number of integrated journeys on 30 consecutive days, in the zones defined by the first first validation, on all modes of transport depending on the zones travelled through (maximum payment 6 zones). Must be accompanied by a national identity document, foreigner identity document or passport. 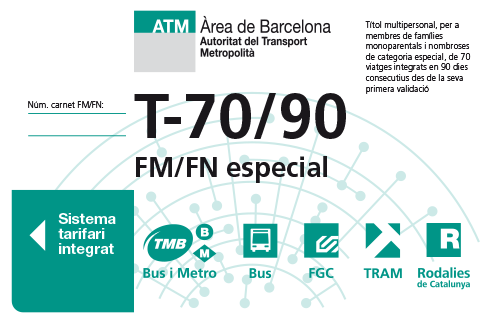 Personal and non-transferable ticket, with an unlimited number of integrated journeys on 90 consecutive days, in the zones defined by the first validation, on all modes of transport depending on the zones travelled through (maximum payment 6 zones). Must be accompanied by the national identity document, foreigner identity document or passport. Personal, non-transferable ticket for young people aged under 25 for an unlimited number of integrated journeys on 90 consecutive days in the zones limited by the zone where the ticket is first stamped, on all modes of transport, depending on the zones passed through (maximum charge 6 zones). The ticket must be accompanied by an identity card, residence card or passport. Provided that documentation is provided to certify that, at the time of buying and first stamping the ticket, the holder was under 25 years of age, the holder can use the T-jove while it remains valid, even if he or she turns 25 during this period. A ticket for multiple users and timeframes, for members of single-parent families and general or special category large families, comprising 70 integrated journeys for 90 consecutive days from the first validation, on all modes of transport according to the fare zones to be crossed (from 1 to 6 zones). The ticket must be accompanied by a National Identity Document, Foreigner Identification Card or passport and single-family or large-family identification card. Personal ticket, with an unlimited number of integrated Journeys during the day on which it is validated until the end of the service, in the areas defined by the first validation, on all modes of transport depending on the zones travelled through (maximum payment of 6 zones). How to ask for a handicap card for you and your accompanying person?